If I made a list of “People I admire greatly but that I’d probably never hang out with for fear of my life and limbs,” Colin Furze would be right at the top. He is a living, breathing mad scientist. This dude has built functional Wolverine claws, shoes to walk on the ceiling and wrist-mounted flame throwers. His latest project: a hoverbike. 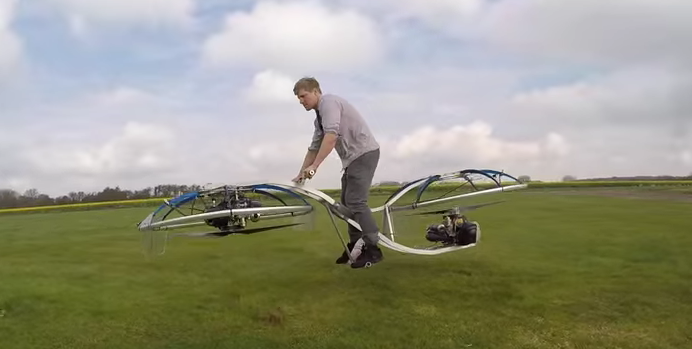 An actual hoverbike. He did it. It has no steering system and is insanely dangerous (watch around 0:50 and 2:10 marks for some moments that could’ve gone much, much worse)… but it works. After a few hours of training to ride it and after hacking just about everything off the frame, he can actually get it to hover.